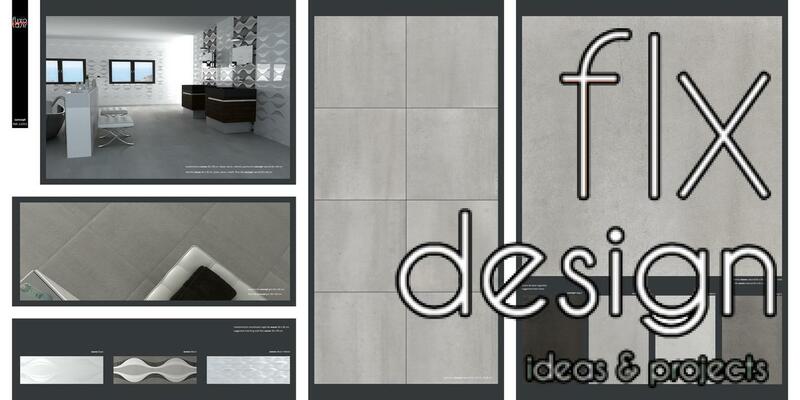 Flexolaser just introduced a new collection in its wide range of cement-look ceramic designs. This is a smooth cement-look design that features an elegant and very contemporary look, according to the latest and most modern decoration trends. As seen in the picture accompanying the story, the design reveals a slight directionality aspect that makes it ideal for large format floor tiles, such as 24×24 or 24×48. This new ceramic collection, available for both floor and wall tiles, has a very silky texture to the touch, and thanks to a thickness application (with large load rollers), provides further volume to the piece and improves its finish. The master tile is complemented with three decor pieces that offer a multitude of decorative options. As many as our imagination can produce. In addition, each piece has its own decorative design process: one features a brilliant luster, another one features a microrelief graph roller application, and the latter a deeper relief press application. Three different and elegant options. As for the color range, the collection is available in three shades of grey, from light grey (very fashionable nowadays) to the traditional charcoal grey and a medium grey shade that blends perfectly with the previous two. In short, a collection of cements ideal for any modern construction, whether residential or commercial.